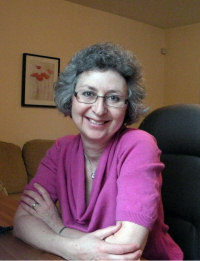 As a therapist, I have worked since 1988 with individuals of all ages, couples, families and groups. After studying in Montreal, I moved to Northern Ontario to work for a Children’s Mental Health agency as a therapist. Four years later, I came to live here, in Cobourg, and worked in Children’s Mental Health for 7 years, as a front line clinician and supervisor. My work has included facilitating groups with women who were abused as children; presenting seminars on Human Relations topics; developing and coordinating a volunteer program; supervising clinical staff; facilitating career plan groups; and working as a school counsellor at a private school setting. It has been a very rewarding career so far, and I love learning things about the human condition and how to help people achieve their potential. Every time I meet a client, I learn something new. I am amazed at how we adapt and find resources to solve our problems. I am honoured to be a part of that process. Currently, I am in private practice, working with clients on a large variety of issues, but specializing in stress and trauma.